San Quintin is a stunning coastal town full of a diversity of people, ranging from Oaxacan immigrants to expatriates that have homes off of the main road in communities like Pedregal and La Chorera. Not only is San Quintin’s demography diverse, but it also has a unique landscape of volcanoes, salt marshes, mudflats, and desert. This array of diversity in landscape and demographics make San Quintin a beautiful tourist destination and a place of interest for Terra Peninsular’s mission of land conservation. Terra Peninsular has bought land in San Quintin to keep hotels and restaurants from purchasing and developing the land. As a result, Terra Peninsular has had to pay people who have lived in the newly purchased reserves to settle in a new place in town. This is a difficulty in conservation, and it has made Terra Peninsular less than popular with the local community. However, Terra Peninsular acknowledges these socioeconomic issues and is trying to break down the barriers the community has put up against the organization. In order to do this, Terra is constantly working to provide local communities with classes on topics they are interested in. 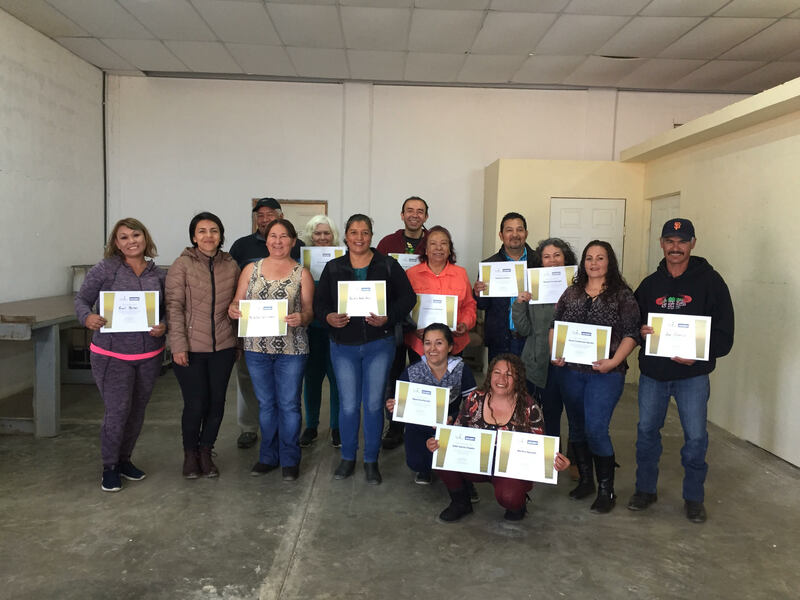 For example, they offered a recycling and composting class sometime in late 2017, and recently offered an artisan workshop for community members of La Chorera, Pedregal, and Chapala. This workshop can potentially benefit the community by offering them a new niche market of commercialism to tourists visiting the area. By cultivating artistic opportunities in this community and utilizing materials from their hometown, Terra hopes to not only provide more opportunities for the community but to also raise awareness and appreciation of their local community. When I first heard of the jewelry workshop, I got really excited and wanted to take the course myself. The instructor, Jose, brought with him Dremel tools, which are used to drill into hard objects such as pebbles and shells. Because the course objective was to increase awareness and appreciation for the community’s natural environment, Jose, Claudia, Christine, and I went on nature walks with members of the workshop on the beach near La Chorera to collect small and distinctive round pebbles. These delicate pebbles were to be inspiration for necklaces, earrings and bracelets in the classroom. Other materials the class used were discarded oyster shells from oyster farms and other scavenged treasures like abalone shells. On the third day of the workshop we went on a nature walk to the beach in La Chorera, and I saw something I had never seen before. There were people sifting through the sand to collect the stones in large plastic sacks. Children as young as maybe three were with their parents, who had probably been at that beach from sunup to collect pebbles they were to sell to construction companies for 40 pesos a sack. Forty pesos is roughly about $2.50. I learned that in one day they could maybe harvest up to three sacks of pebbles or stones, making up to 120 pesos a day. That’s seven dollars and fifty cents! Some of the women we reached through this art workshop shared their stories of their beginnings in San Quintin, and shared that when work was slow they had worked harvesting stones near the dunes. It is not only hard work, but it also contributes to land degradation and alters the natural habitat. 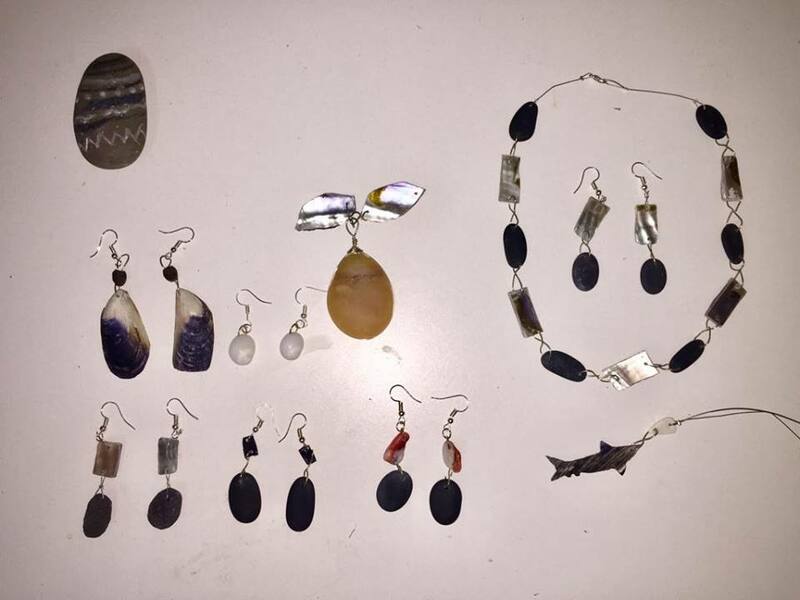 The possibilities of creating artisan jewelry that’s worth more than 120 pesos is not only feasible, but it is also a great opportunity to cultivate deeper love and appreciation for the flora and fauna of San Quintin (for tourists and locals alike). Creating jewelry is also a way for people to express themselves through a creative outlet. I personally really liked this workshop. I believe that art is critical and human beings need a way to express themselves, so what better way than to create something beautiful? During this workshop I really got to know the people we were serving and I got to see them develop as artisans. It was incredible to see the difference between the first class to the third to the last. Their creative juices were flowing!